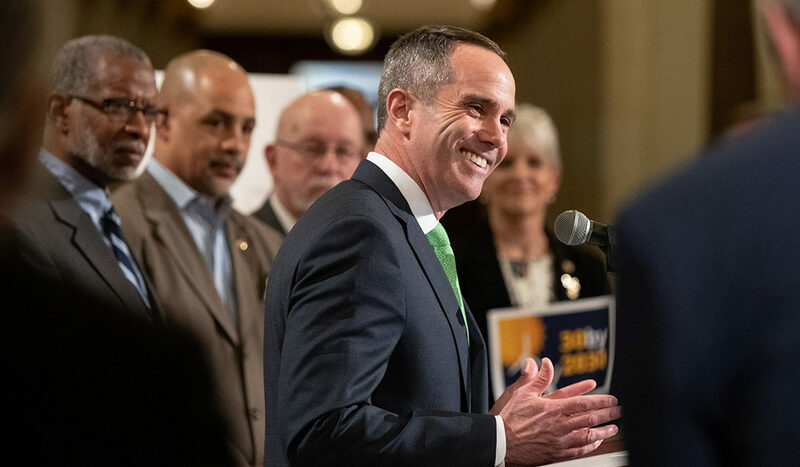 HARRISBURG − April 10, 2019  − State Senators Steven J. Santarsiero (D-10), Art Haywood (D-4), Thomas H. Killion (R-9), and state Representatives Steve McCarter (D-154) and Carolyn Comitta (D-156), were joined by renewable energy advocates in the Main Capitol Rotunda to express their support for expanding the Alternative Energy Portfolio Standards Act (AEPS). Sen. Haywood has district offices in Philadelphia and Abington can be reached via email here. Visit the district website at www.senatorhaywood.com. Sen. Killion has district offices in West Goshen and Brookhaven and can be reached via email here. Visit the district website at www.senatorkillion.com. Rep. McCarter has a district office in Glenside and can be reached via email here. Visit the district website at www.pahouse.com/McCarter/. Rep. Comitta has a district office in West Chester and can be reached via email here. Visit the district website at www.pahouse.com/Comitta/.